Nadine Clair, mother of a child with Coats’ disease, talks about their difficulty getting a diagnosis and how she’s helping to raise awareness of the rare condition. Violet had just turned one when we noticed something different about her left eye. It seemed to change colour from brown to green, while the right eye remained brown. At the time I didn't think too much of it, as I had previously Google searched about an iris changing colour which I read was perfectly normal for babies of that age. However, one night a lamp was shining onto Violet’s face and there was hardly any colour to her iris and her pupil was white. We did what most concerned parents would do and started to search online for "no iris colour, clear pupil". I did this all night and found the same results, that it could be serious. My heart sank as I continued to look for more information. I came across Know the Glow website, which aims to raise awareness of children who have “the glow” – which in medical terms is called Leukocoria (literally meaning “white pupil”). This is due to a lack of red reflex in the eye. When we take photographs sometimes you can get red eye, however a white or yellow glow could be a sign of something more serious. They encourage parents to be alert if a glow is seen through flash photography (visible in more than one photo, as sometimes it can be the angle the light catches the eye). I started looking at photos I'd recently taken and there it was, photo after photo, “the glow” in my babies left eye. I knew we had to take action, so the very next day I booked an emergency GP appointment. The next day dragged while we waited for the appointment. I couldn't wait for him to tell me I was an over-observant mother and that there was nothing wrong. As we sat down and explained what we found, the doctor looked in Violet's eyes and confirmed there was no red reflex. However, he didn't seem concerned and said if we wanted he’d refer us to an optometrist at our local hospital. We said yes and the next available appointment was five months away! I knew I couldn't wait that long, because as much as I just wanted to hear a doctor say that nothing was wrong, I also had a strong feeling that something wasn't right. I decided to book an appointment at an optician, because if anyone knows eyes it’s them – right? Wrong. They had no idea what was wrong. She explained there was a white cloud in the eye and told me to wait for the appointment at our local hospital. Not one person made me feel comfortable to wait that long, so we decided to go straight to Moorfields Eye Hospital. We met with the most caring and amazing doctor we could have wished for Violet. They dilated her eyes and began to examine them. He agreed that we did the right thing to take her there. He diagnosed Violet with Leukocoria and referred us to a paediatric eye specialist for further tests. The next day I received a call from a cancer nurse specialist, which was a total shock. I can't really remember that call very clearly as most of it was spent sitting on my kitchen floor blocking my three kids from coming in and seeing me so distraught. The nurse was amazing and explained that the doctor felt it necessary to refer Violet for immediate investigation of retinoblastoma (childhood eye cancer). There's no words to explain how hearing those words make you feel. These things don't happen to your family. Suddenly I didn't feel so bad for pushing for more checks and was glad I Googled it so much that night. But I also had a tremendous amount of guilt... What if it was cancer? Why didn't I do something sooner? Something we all do as parents. From the phone call to our appointment was a whole seven days. It doesn't seem much, but anyone who has been through something like this will tell you it feels like a year! Our world fell apart that week, not knowing what was happening and trying to get through the week as normal as we could. Playing with the kids, keeping smiles on our faces throughout the day and then spending every evening looking for more information – because hey, who really needs sleep anyway! On 28 February (World Rare Disease Day), Violet has her appointment at the Royal London Hospital. It was a tough day, but the staff were amazing and we had a specialist nurse beside us throughout. When the examination was finished, her consultant came in to see us. 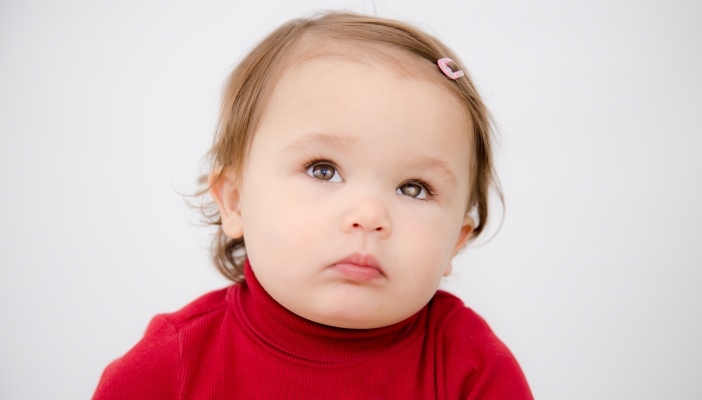 We were told that Violet didn’t Retinoblastoma and there was a huge sigh of relief from us. But reality soon hit – if it wasn’t that, what was it? Violet was finally diagnosed with Coats’ disease. A very rare disease that affects roughly 1 in 100,000 boys and only 1 in 3 affected are girls. It’s not hereditary, she was born with this and the causes aren’t known because of lack of research and funding. As the disease had progressed so quickly, Violet has unfortunately lost her sight and is now blind in her left eye. It saddens me every day, but if we left it for longer than we did she could’ve had to have the eye removed, so for that we must be grateful. After the initial shock of Violet’s diagnosis, I spent hours searching the internet looking for information. Unfortunately I could hardly find anything. I began to look for support groups in the UK to talk and meet with other parents of children with Coats’ disease, but I couldn’t find anything. During a meeting with a consultant at Great Ormond Street Hospital, I brought this up and also spoke about setting up an awareness/support page for Coats' disease and other “Glow” related diseases. I wanted to spread awareness, talk about the signs that parents may spot (i.e. “the glow” from flash photography) and the importance of eye tests, and help connect parents so they can provide support to one another. Three months ago, I created the Facebook group Violet’s Glow (awareness for Coats’ disease UK) and it now has over 2,300 members. I ask all parents to join the group, read the page information and share it with other families so that we can help save sight together. The page has already made one parent seek advice after spotting the white reflex, which the child has now been diagnosed with cataracts. We’re thankful that the parent saw our Facebook posts and contacted us. Our next aim is to find the right people to help us move forward. We want to produce posters and leaflets for opticians, GP surgeries, hospitals, play groups and schools – even putting something in the baby red books you receive when you have a baby. We need to continue to raise awareness and also be the support group that the UK needs, as we don’t have one at present. We are only at the start of Violet's journey, but we must have faith in doctors to save Violet’s eye. Coats’ disease is so rare that not many professionals are aware of it. Noticing “the Glow” along with seeking immediate medical advice from an eye specialist can help detect up to 16 eye conditions and possibly save a child's sight (or even their life)! So please take photos, put on the flash and turn off red eye detector, and be aware of “the glow”. If you see it once, remain alert. If you see it repeatedly, take action. No child deserves to go blind through lack of early detection. Awareness needs to be raised, early eye tests need to be made compulsory and researchers need funding to find a cure for this awful disease.